When the dust cleared during a crash-filled Nationwide Series race at Talladega Superspeedway, Regan Smith stop at the top. 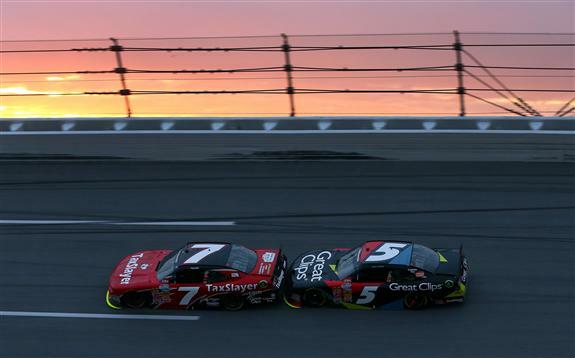 The race was delayed three hours by rain and slowed by seven cautions, and as darkness closed in, NASCAR cut the race distance by 10 laps. Then a caution one lap shy of the new scheduled finish and NASCAR decided it would make one attempt at a green-white-checkered finish. After a video review, Smith was determined to be in the lead when the caution was declared. The win moved Smith into the points lead for the first time in his career, and for the first time for JR Motorsports.